Letters and Papers, Foreign and Domestic, Henry VIII, Volume 20 Part 1, January-July 1545. Originally published by His Majesty's Stationery Office, London, 1905. 234. Francis Earl of Shrewsbury. Original. Great seal lost. Large parchment. 235. Chapuys and Van der Delft to Charles V.
Bearer is Secretary Paget. who sends word that did time allow he would come and show the writers the details of his mission. Probably his instructions will be more moderate and his powers more ample than those of Hertford and Winchester. His attachment to the Emperor's interests and favour shown to his ministers should gain him a good reception. London, 21 Feb.
236. Shrewsbury, Tunstall and Sadler to Henry VIII. Send letters and writings received from Lenoux and Lord Wharton. Touching the Larde Tullybarne of whom Wharton writes, they have written again to Wharton to see to his entertainment at Carlisle until the King's pleasure is further known. Darneton, 21 Feb. Signed. In Sadler's hand, p. 1. Add. Endd. : 1544. 237. Carne to Henry VIII. Yesterday, hearing that an ambassador of Scotland should arrive here shortly and lay the night before at Nostre Dame de Hales, 3 leagues hence, sent a servant thither, who learnt that, on the 16th inst., came thither an ambassador of Scotland who had been with the French king and was coming to the Emperor, with 10 horses and 9 servants. He lay there from Tuesday till Friday after dinner, when he went with four servants "to a place where the Lady Regent should be that afternoon," while the other five servants came hither with his cloth sack. The Regent was on Friday afternoon abroad on pretence of hawking, "so that undoubtedly the said ambassador is hereabouts covertly." 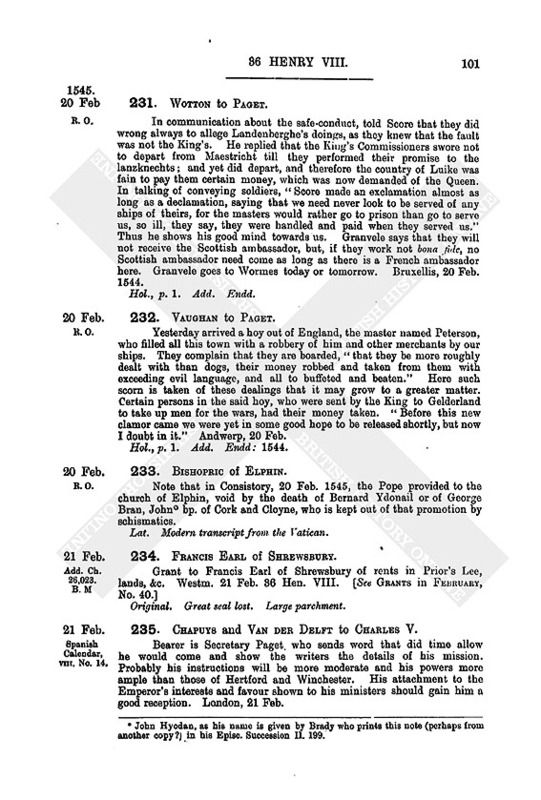 This shows their "privy proceedings" here. Grandvell is already gone towards the Diet. Bruxells, 21 Feb. Signed. P. 1. Add. Endd. : 1544. Perceiving, since he wrote on the 19th, that all things pass not so plainly as was "declared by Monsr. Grandvylle and the President to Mr. Wotton touching the Scots," he now writes to the King to show "their simulation." Bruxells, 21 Feb. Signed. P. S. — "I cannot hear yet that the ships here be released." 239. Charles V. to Chapuys and Van Der Delft. Received theirs of the 5th inst. reporting conversation with the Master of the Horse and Paget. Understands that restitution in England has not been properly effected, ships remaining there, the herring being sold without the owners' consent and other property detained. Wishes they had written of the value of goods remaining and of the method of restitution, together with advice as to the release here, for which the King and his ambassador press. They must write as soon as possible therein, not forgetting the Burgos property and all goods seized since the beginning of last year. 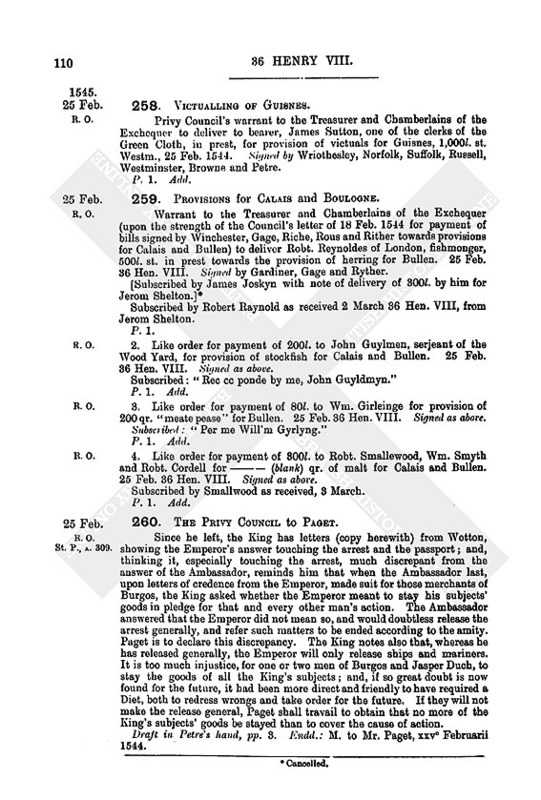 To please the ambassador, the Emperor offered to release the ships and raise the embargo on English property, upon security pending the restitution in England. Told him that the Burgos claim was the stronger for being so old, and that some measure ought forthwith to be agreed upon to protect the subjects of both sides. The ambassador asked if release was to be deferred until the Burgos and other old claims were settled and the aforesaid security obtained. He has pressed "vehemently and rudely" for passports for German and Italian soldiers, unconvinced by such arguments as that the Emperor is not bound by the treaty to grant them and the damage done by Landenberg's men and other bands. Told him moreover that the States of the Empire were endeavouring to renew the prohibition of the raising of mercenaries owing to the need for soldiers against the Turk, but we had indicated how his master might get troops, and we would look the other way, which was more than we would do for the French. As for the declaration against France required by Hertford and Winchester, upon which you write that you closed the mouths of the English, you should have written the arguments you used, as the matter is most important and was our reason for sending you, Chapuys, to England. The ambassador here presses us hard, and has gone so far as to say that his master must have an answer yes or no. 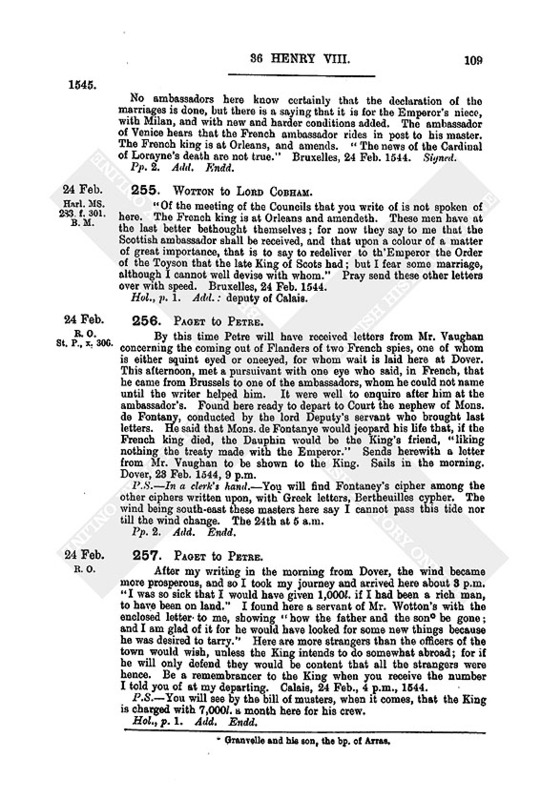 They should write all that they have heard on the subject, and their opinion; and meanwhile postpone the declaration, assuring the King that the Emperor will do all he can consistently with his treaty made with France by the King's consent; maintaining the non-fulfilment of the agreement by England and not appearing to know that the ambassador here is pressing for a decision. Brussels, 21 Feb. 1545. 240. Vaughan to Henry VIII. Yester[day] a broker born in France came to the English House to tell him a very secret matter, requiring promise of 1,000 cr. before revealing it, "which 1,000 crowns, he said, he would find means should be paid in England by the French king." 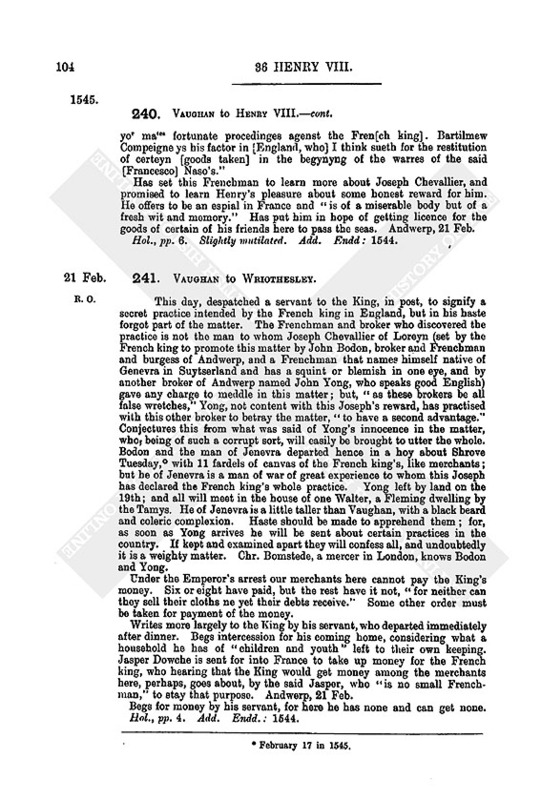 Describes how he induced the broker, finally, to declare that the French king had sent hither a gentleman of Loreyn, named Joseph Chevallier, who despatched hence, two days ago, a Frenchman, burgess of Andwerp, named John Bodon, together with a man who names himself a native of Jenevra but is a Frenchman, to go by sea to London. Chevallier delivered them 11 packs of canvas to sell, for their maintenance; and has also sent John Yong, a broker of this town who speaks English well, by land, to join them. They will lodge at "a Fleming's house dwelling by the Tamys [na]med Water." The first two are to view the Isle of Sheppey, Margate and the ground between that and London. The French king has bruited that he will this summer send forth three armies, one to land in England, the second in Scotland and the third to attack Bulleyn, Guysnes and Calles; but his purpose is to send none to Scotland, he having arranged with the Scots to set upon the North of England when his armies arrive at Margate and Bulleyn. The army will be landed at Sheppey and Margate with much victual and only small ordnance set upon frames of wood, and will be strong enough to give battle and go through to London, where is a hill from whence (says the broker) their ordnance may beat the town. This hill "as I g[uess should] be about Fynsbury or More Felde. [The French] kyng (he saith) is not minded to land [his army at] any port in England, for he saith he ha[th heard] that if his ships should enter into the sam[e ever so] strong, so were it like that he should haza[rd the] bowgyng of ij or iij of his ships, which [if they] were bowged should either let those of his s[hips that] should be already entered into the ports or those [that would] after enter." The man born in Jenevra has a squint eye or a blemish in one eye, and, although going as a merchant, is a man of war. John Yong knows nothing of the charge of the other two but will be used by them to learn news. The party who discovered these matters, being of great acquaintance with Chevallier, was asked to go, but refused, and so lost "the best knowledge of [the] matter." The men should be apprehended and kept apart; and their canvas seized, as it is the French king's. Yong departed hence on the 19th. Hears that the French king has sent for Jasper Dowche to help him to have money of the merchants upon interest, as Henry had; and he is going. It may be that the French king will use him to prevent Henry getting more money here. "This Jasper [is] good French; and so I fynde all th'Ytalien mar[chaunts of] this town; emonges all other, here ys one F[rancesco] Naso, a Florentyne, a marchaunt that sto[macketh much] yor mates fortunate procedinges agenst the Fren[ch king]. Bartilmew Compeigne ys his factor in [England, who] I think sueth for the restitution of certeyn [goods taken] in the begynyng of the warres of the said [Francesco] Naso's." Has set this Frenchman to learn more about Joseph Chevallier, and promised to learn Henry's pleasure about some honest reward for him. He offers to be an espial in France and "is of a miserable body but of a fresh wit and memory." Has put him in hope of getting licence for the goods of certain of his friends here to pass the seas. Andwerp, 21 Feb. Hol., pp. 6. Slightly mutilated. Add. Endd: 1544. This day, despatched a servant to the King, in post, to signify a secret practice intended by the French king in England, but in his haste forgot part of the matter. The Frenchman and broker who discovered the practice is not the man to whom Joseph Chevallier of Loreyn (set by the French king to promote this matter by John Bodon, broker and Frenchman and burgess of Andwerp, and a Frenchman that names himself native of Genevra in Suytserland and has a squint or blemish in one eye, and by another broker of Andwerp named John Yong, who speaks good English) gave any charge to meddle in this matter; but, "as these brokers be all false wretches," Yong, not content with this Joseph's reward, has practised with this other broker to betray the matter, "to have a second advantage." Conjectures this from what was said of Yong's innocence in the matter, who being of such a corrupt sort, will easily be brought to utter the whole. Bodon and the man of Jenevra departed hence in a hoy about Shrove Tuesday, (fn. n1) with 11 fardels of canvas of the French king's, like merchants; but he of Jenevra is a man of war of great experience to whom this Joseph has declared the French king's whole practice. Yong left by land on the 19th; and all will meet in the house of one Walter, a Fleming dwelling by the Tamys. He of Jenevra is a little taller than Vaughan, with a black beard and coleric complexion. Haste should be made to apprehend them; for, as soon as Yong arrives he will be sent about certain practices in the country. If kept and examined apart they will confess all, and undoubtedly it is a weighty matter. Chr. Bomstede, a mercer in London, knows Bodon and Yong. Under the Emperor's arrest our merchants here cannot pay the King's money. Six or eight have paid, but the rest have it not, "for neither can they sell their cloths ne yet their debts receive." Some other order must be taken for payment of the money. Writes more largely to the King by his servant, who departed immediately after dinner. Begs intercession for his coming home, considering what a household he has of "children and youth" left to their own keeping. Jasper Dowche is sent for into France to take up money for the French king, who hearing that the King would get money among the merchants here, perhaps, goes about, by the said Jasper, who "is no small French-man," to stay that purpose. Andwerp, 21 Feb.
Begs for money by his servant, for here he has none and can get none. Hol., pp. 4. Add. Endd. : 1544. Begs help to obtain his licence to come home. The ambassador will not labour for his discharge unless commanded by the King or the Council. Paget knows what a household of young folks he has keeping his property and themselves. Has nothing here to do and no money; and the merchants are unable to pay what they are appointed. Begs therefore to be released from this arrest. Damesell, the King's servant, can do all; and is privy to the King's affairs, and was present at the disclosing of the French king's practice which Vaughan signified to the King this day. Andwerp, 21 Feb. Hol., p. 1. Add. Endd. : 1544. 243. The Privy Council to Shrewsbury. As the King's subjects of Hull now set forth at their own charges 3 ships and 3 shalloppes, Shrewsbury is to travail earnestly that those of New-castell may do the semblable; for, by doing so out of hand and joining with those of Hull, they shall keep open their own trade, encourage others, annoy the enemies and do the King service. Draft in Petre's hand, pp. 2. Endd. : M. to therle of Shrewesbury, xxijo Februarii, 1544. 244. The Privy Council to Shrewsbury. 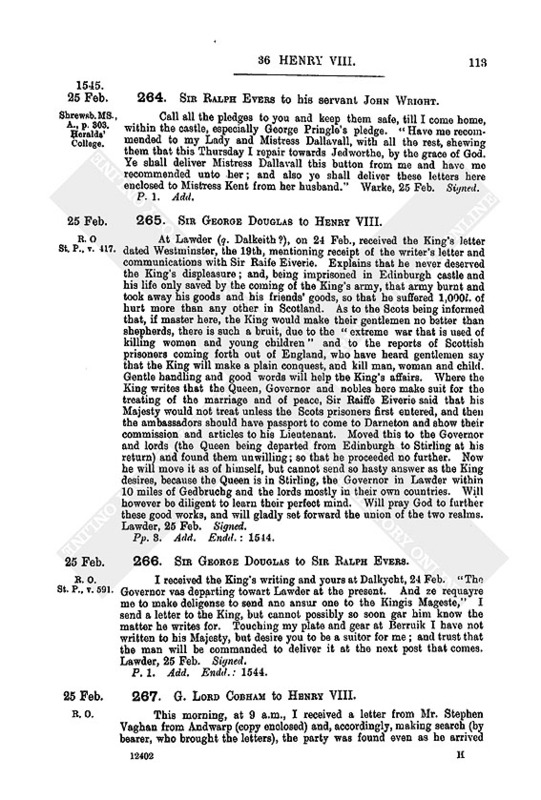 The King, understanding by letters from Sir Ralph Eure, lord warden of the Middle Marches, that the Scottish gentlemen of Tyvidaill (complaining that they have not had the aid of men and money promised and cannot withstand the malice of Buckleugh and other enemies) are in despair and like to revolt to the Scottish faction, unless "aid be the rather provided for them," thinks this matter of great importance as likely to discourage others. Such men and money shall be sent as may "presently" help and encourage them to continue their service to the King. Wrote of this before; yet, as they seem to require some present comfort, the King eftsoons reminds him of it. Though the treasure there be spent, "you will make shift for money otherwise." Money goes hence towards you tomorrow. Westm., 22 Feb. Signed by Wriothesley, Suffolk, Russell, Browne, Petre. In Petre's hand, p. 1. Add. : lieutenant general in the North. 245. Anthony Cave to John Johnson. Tykfford, 22 Feb. 1544:—Commendations to your bedfellow and thanks for your letter and your apples. This evening I received a letter from Ambrose of the 10th inst. and one from Mr. Smythe of the 19th, showing that the restraint in Flanders continues "and the thing is much doubted how it will stand; wherefore I am glad ye went not to Mr. Conye, as I perceive ye were going, but ye staid because ye heard he was in commission for the Benevolence." Pray speak to John Morton to make me 24 doz. of candle, 4 doz. each of four, six and eight to the pound and the rest smaller, and send them hither. Show father Morton that I am sorry for his disease and will pray for him as he did for me; and take his reckoning of the last "serpllz" of wool. P. S.—"I trust ye wilbe here according unto your appointment, where ye shall be welcome." Hol., p. 1. Add. : at Glapthorne. This day I received your letter of the 18th, and, howbeit Mons. Granvele, Mons. Darras and the Councillor Boisot left for Wormes yesterday, I considered that he could not be so far but that he might be revoked. I therefore wrote three or four lines declaring the King's desire for the staying of Granvele until your coming, and sent the bill to Adryan of the Chamber (for that was a shorter way than to send to the Queen), who showed it to the Emperor, "for he can neither write nor read himself, and therefore th'Emperor putteth him in the more trust." The Emperor sent him back to say that Granvele was two days' journey on his way and went for important matters which could not be deferred, nor was of that age that he might come back and afterwards ride in post to the Diet; and therefore willed me and you to be content to resort to the Queen his sister. Bruxelles, 22 Feb. 1544. Signed. 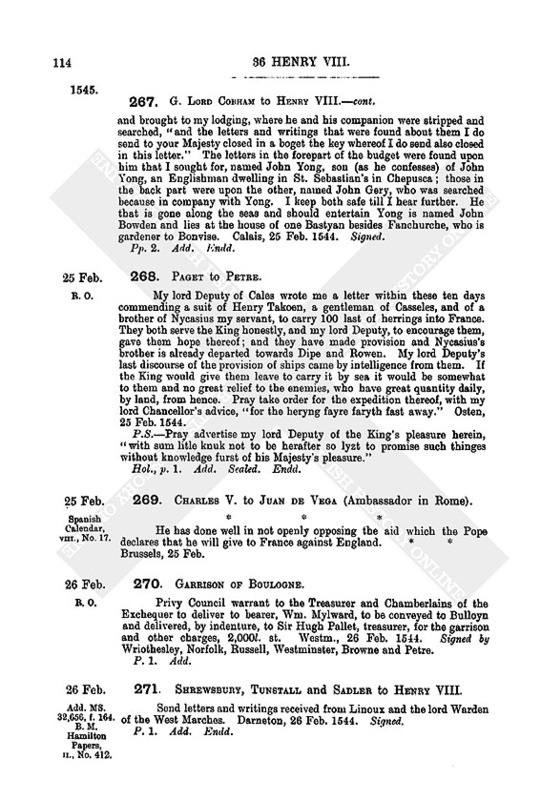 Inventory of plate and jewels in various rooms, i. e., "In the ijde room," "In the iijde room," "In the first room beneath the lowest storey," &c.
Among them are spoons with the Lord Cromwell's and the earl of Essex' arms and a "picture of Prince Edward's face graven in agathe set in gold." The list for one of the rooms bears this note in the margin:— "The King's Majesty took all these parcels away himself the first Sunday in Lent a" 36 regni sui, (fn. n3) to what purpose he declared not. Report made hereof to me by James Rufforth." 248. Shrewsbury, Tunstall and Sadler to Henry VIII. Send letters received from the Wardens of the East and Middle Marches, showing that the Governor and others of the nobility of Scotland are marching towards the Borders with a great power, apparently to repress such Scottishmen as have entered the King's service. As the time is too short to reinforce the Wardens out of the Bishopric we have written to them to risk nothing. Darneton, 23 Feb. 1544. Signed. 249. Robert Maxwell to Lennox. From John Dowglas I received your letter dated Carlyle, 22 Feb., and perceive thereby that you think the credit sent by Dowglas very important to be sent by mouth, and would know clearly what I will do to advance the King's affairs and yours, in this realm, that thereupon you may be a suitor for my father; and where I say that, my father being at liberty in Scotland, I will deliver him his houses and serve him, "zour 1. thinkis sum thing strange bot I suld do in ewery thing my father's commandement, he boand on lif." In my foolish opinion the credence I sent by John Dowglas was to the setting forward of the King's affairs and yours, and to the common weal of both realms; and, not knowing what in my power may stand with the King's pleasure and be for the liberty of my father, I desire you to send me advertisement thereof. I am indebted to you for the suit you have made in my father's favour, and beg you to obtain me licence for a servant to pass to my father with such necessaries as he has written for and to learn his pleasure. In this I fear my lord Quhartoun is evil to me, albeit I have deserved little unkindness of him and he has given me occasion to do my worst towards him. Remember how hardly my father was handled in this realm for favouring the King's affairs. I will leave nothing undone to obtain his liberty. Drumfres, 23 Feb. Signed. 250. Vaughan to the Council. Is secretly told that the Countie Palentyne, secretly aided by the Emperor and bp. of Rome, intends to set upon the King of Denmark; "whereof if it might please the K's Mate to advertise the same King it would purchase a great love between them." Bearer, his brother-in-law, Thos. Lodge, goes into England to dog John Yong, one of the three sent about the French king's practices. Yong did not leave on the 19th; but, yesterday, meeting with Wm. Damsell, said that he would depart this morning. Lodge will follow or go before him, riding by night, to Calles and thence to London. Doubtless, strange practices will be learnt. Long ago, delivered the King's licence to Jasper Dowche, who will not now go; and therefore notice should be sent to Calles and other places to stay anyone coming with the said licence. Lately received a letter for my lord of Suffolk and sent it, enclosed in one to a friend, to the house of Bonvyce to be forwarded by the merchants' post. It is important; and, if not received, please send to my house to John Griffith asking if the Bonvyce in London delivered him not such a letter enclosed in one of mine. The post who carried it left yesterday morning. Because Musica, the King's servant, signifies to Mr. Secretary the occurrents and many other "knowledges," I spare to cumber you with superfluous writings. Andwerp, 23 Feb.
John Yong is a base son of an Englishman, born in Spain, speaks good English and is well known to all our merchants that haunt these parts. P. S.—My lord of Suffolk has here Dr. Marten, a physician, of great acquaintance in these parts, who may get many secret knowledges and should be encouraged by a letter from the Council. "I send herewith Musikes I're, to[gether]s with a I're of the sayde Doctor Marten to my lord of Suff. grace." Hol., pp. 3. Add. Endd. : 1544. 251. Ric. Chamond to Jelbertt Flammake of Bocarn beside Bodman. Requires him in the King's name to prepare to serve the King's Majesty in the wars, with the writer. Efforde, St. Mathey ys day 24 Feb. Signed. 252. Shrewsbury, Tunstall and Sadler to Henry VIII. Send letters received from the Wardens of the West and Middle Marches, the latter writing his advice what Scottishmen in the King's service seem meet to have wages with some small number of Englishmen in garrison among them. Beg to know whether to "ensue that advice." Darneton, 21 Feb. signed. 253. Shrewsbury, Tunstall and Sadler to Henry VIII. Send letters received from the Wardens of the East and Middle Marches confirming the assembly of the Scots towards the Borders to distress such as have entered the King's service, for whose relief the Wardens are preparing. By the letters, the Scots seem to be in greater power than is possible considering the scarcity of victuals in their country; but the writers have, nevertheless, warned all the Bishopric to set forward towards the Borders, and, as the Borders are so disfurnished of victuals, every man is ordered to carry 10 days' victual with him. Have just received a letter from the Council ordering them to send aid of men and money to the Scottish gentlemen of Tividale, who complain that they are not aided as was promised, and in despair are like to turn again to the Scottish faction. Have therefore eftsoons written to the Wardens to give aid without hazarding too much. Remind the King that they still await answer whether to lay garrisons of Englishmen in Tyvidale. Where the Warden of the Middle Marches is of opinion that the Warden of the West Marches should do some exploit about Hawycke now that the enemies are assembled on the other Borders, we have written to him accordingly. Darneton, 24 Feb. 1544. Signed. 254. Wotton to Henry VIII. On the 24th inst. President Schore and Mons. 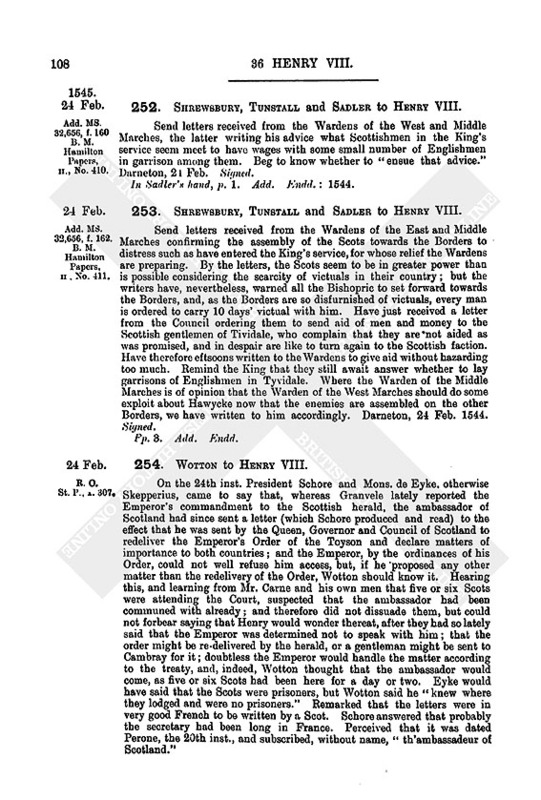 de Eyke, otherwise Skepperius, came to say that, whereas Granvele lately reported the Emperor's commandment to the Scottish herald, the ambassador of Scotland had since sent a letter (which Schore produced and read) to the effect that he was sent by the Queen, Governor and Council of Scotland to redeliver the Emperor's Order of the Toyson and declare matters of importance to both countries; and the Emperor, by the ordinances of his Order, could not well refuse him access, but, if he 'proposed any other matter than the redelivery of the Order, Wotton should know it. Hearing this, and learning from Mr. Carne and his own men that five or six Scots were attending the Court, suspected that the ambassador had been communed with already; and therefore did not dissuade them, but could not forbear saying that Henry would wonder thereat, after they had so lately said that the Emperor was determined not to speak with him; that the order might be re-delivered by the herald, or a gentleman might be sent to Cambray for it; doubtless the Emperor would handle the matter according to the treaty, and, indeed, Wotton thought that the ambassador would come, as five or six Scots had been here for a day or two. Eyke would have said that the Scots were prisoners, but Wotton said he "knew where they lodged and were no prisoners." Remarked that the letters were in very good French to be written by a Scot. Schore answered that probably the secretary had been long in France. 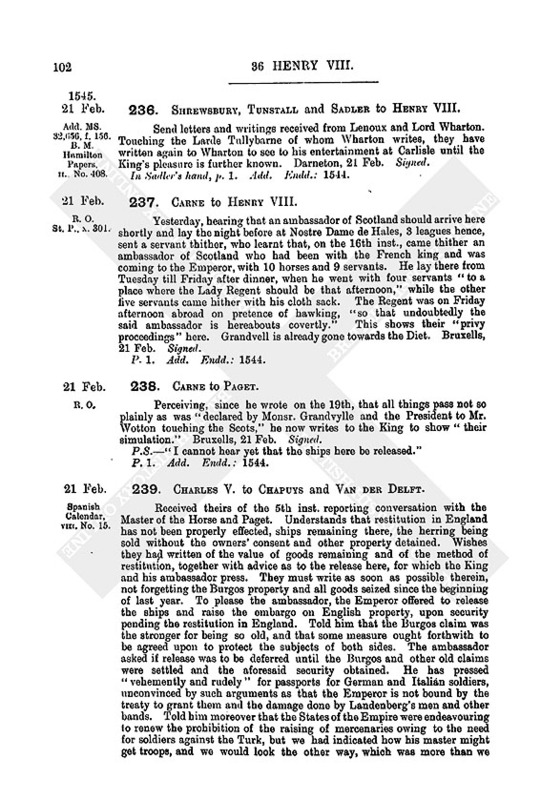 Perceived that it was dated Perone, the 20th inst., and subscribed, without name, "th'ambassadeur of Scotland." No ambassadors here know certainly that the declaration of the marriages is done, but there is a saying that it is for the Emperor's niece, with Milan, and with new and harder conditions added. The ambassador of Venice hears that the French ambassador rides in post to his master. The French king is at Orleans, and amends. "The news of the Cardinal of Lorayne's death are not true." Bruxelles, 24 Feb. 1544. Signed. 255. Wotton to Lord Cobham. "Of the meeting of the Councils that you write of is not spoken of here. The French king is at Orleans and amendeth. These men have at the last better bethought themselves; for now they say to me that the Scottish ambassador shall be received, and that upon a colour of a matter of great importance, that is to say to redeliver to th'Emperor the Order of the Toyson that the late King of Scots had; but I fear some marriage, although I cannot well devise with whom." Pray send these other letters over with speed. Bruxelles, 24 Feb. 1544. By this time Petre will have received letters from Mr. Vaughan concerning the coming out of Flanders of two French spies, one of whom is either squint eyed or oneeyed, for whom wait is laid here at Dover. This afternoon, met a pursuivant with one eye who said, in French, that he came from Brussels to one of the ambassadors, whom he could not name until the writer helped him. It were well to enquire after him at the ambassador's. Found here ready to depart to Court the nephew of Mons. de Fontany, conducted by the lord Deputy's servant who brought last letters. He said that Mons. de Fontanye would jeopard his life that, if the French king died, the Dauphin would be the King's friend, "liking nothing the treaty made with the Emperor." Sends herewith a letter from Mr. Vaughan to be shown to the King. Sails in the morning. Dover, 23 Feb. 1544, 9 p. m.
P. S.—In a clerk's hand.—You will find Fontaney's cipher among the other ciphers written upon, with Greek letters, Bertheuilles cypher. The wind being south-east these masters here say I cannot pass this tide nor till the wind change. The 24th at 5 a. m.
After my writing in the morning from Dover, the wind became more prosperous, and so I took my journey and arrived here about 3 p. m. "I was so sick that I would have given 1,000l. if I had been a rich man, to have been on land." I found here a servant of Mr. Wotton's with the enclosed letter to me, showing "how the father and the son (fn. n4) be gone; and I am glad of it for he would have looked for some new things because he was desired to tarry." Here are more strangers than the officers of the town would wish, unless the King intends to do somewhat abroad; for if he will only defend they would be content that all the strangers were hence. Be a remembrancer to the King when you receive the number I told you of at my departing. Calais, 24 Feb., 4 p. m., 1544. P. S.—You will see by the bill of musters, when it comes, that the King is charged with 7,000l. a month here for his crew. Privy Council's warrant to the Treasurer and Chamberlains of the Exchequer to deliver to bearer, James Sutton, one of the clerks of the Green Cloth, in prest, for provision of victuals for Guisnes, 1,000l. st. Westm., 25 Feb. 1544. Signed by Wriothesley, Norfolk, Suffolk, Russell, Westminster, Browne and Petre. 259. Provisions for Calais and Boulogne. Warrant to the Treasurer and Chamberlains of the Exchequer (upon the strength of the Council's letter of 18 Feb. 1544 for payment of bills signed by Winchester, Gage, Riche, Rous and Rither towards provisions for Calais and Bullen) to deliver Robt. Reynoldes of London, fishmonger, 500l. 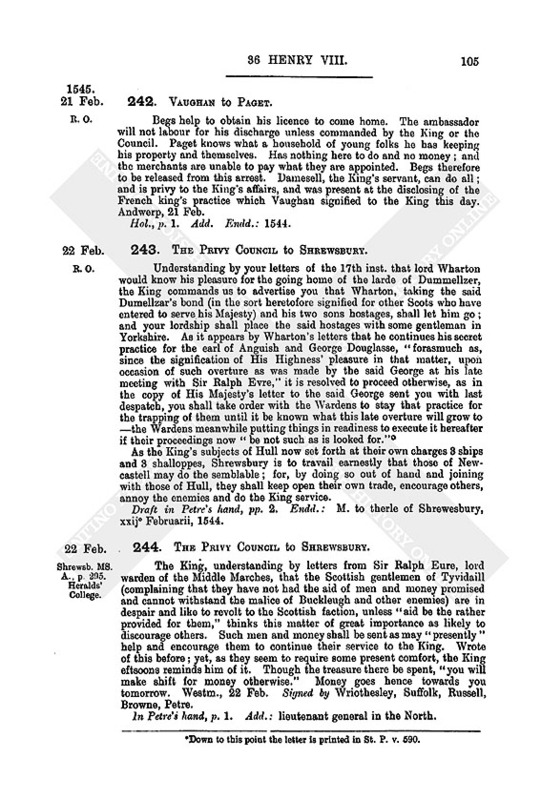 st. in prest towards the provision of herring for Bullen. 25 Feb. 36 Hen. VIII. Signed by Gardiner, Gage and Ryther. Subscribed by Robert Raynold as received 2 March 36 Hen. VIII, from Jerom Shelton. 2. Like order for payment of 200l. to John Guylmen, Serjeant of the Wood Yard, for provision of stockfish for Calais and Bullen. 25 Feb. 36 Hen. VIII. Signed as above. Subscribed: "Rec cc ponde by me, John Guyldmyn." 3. Like order for payment of 80l. to Wm. Girleinge for provision of 200 qr. "meate pease" for Bullen. 25 Feb. 36 Hen. VIII. Signed as above. Subscribed: "Per me Will'm Gyrlyng." 4. Like order for payment of 300l. to Robt. Smallewood, Wm. Smyth and Robt. Cordell for— (blank) qr. of malt for Calais and Bullen. 25 Feb. 36 Hen. VIII. Signed as above. 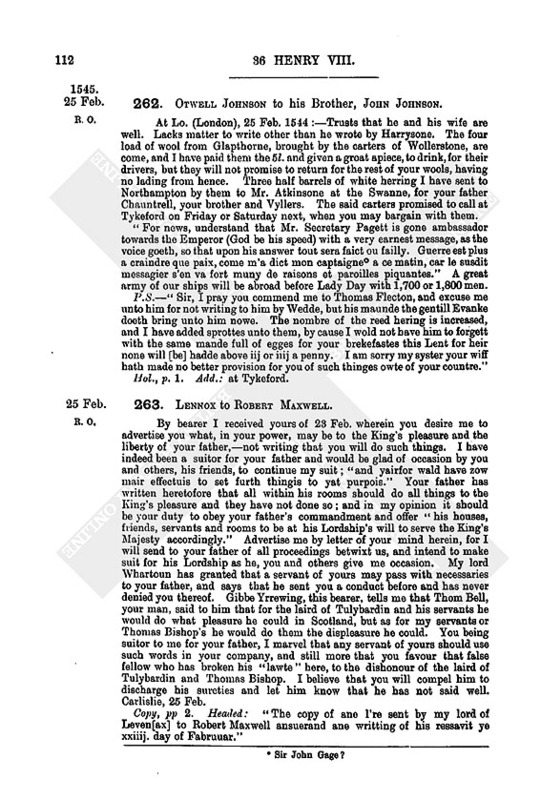 Subscribed by Smallwood as received, 3 March. 260. The Privy Council to Paget. Since he left, the King has letters (copy herewith) from Wotton, showing the Emperor's answer touching the arrest and the passport; and, thinking it, especially touching the arrest, much discrepant from the answer of the Ambassador, reminds him that when the Ambassador last, upon letters of credence from the Emperor, made suit for those merchants of Burgos, the King asked whether the Emperor meant to stay his subjects' goods in pledge for that and every other man's action. The Ambassador answered that the Emperor did not mean so, and would doubtless release the arrest generally, and refer such matters to be ended according to the amity. Paget is to declare this discrepancy. The King notes also that, whereas he has released generally, the Emperor will only release ships and mariners. It is too much injustice, for one or two men of Burgos and Jasper Duch, to stay the goods of all the King's subjects; and, if so great doubt is now found for the future, it had been more direct and friendly to have required a Diet, both to redress wrongs and take order for the future. If they will not make the release general, Paget shall travail to obtain that no more of the King's subjects' goods be stayed than to cover the cause of action. Draft in, Petre s hand, pp. 3. Endd. : M. to Mr. Paget, xxvo Februarii 1544. 261. Chapuys and Van der Delft to Charles V.
Received his letter of the 21st yesterday. The restitution here has been made with great diligence and care. As few claimants appeared, the King requested the writers to name a trustee for the unclaimed property; and they named Angelon Salvaglio, a substantial Genoese merchant, who, finding no one come to claim, sold the herrings at as good a price as the owners could have got. The quantity is small compared with that demanded by the Flemings—not above 140 lasts. The rest of the merchandise is chiefly pitch and tar, about 150 lasts (memorandum herewith). The greater part of the merchandise must still be at Dover, Calais and Boulogne, but the writers cannot learn its value and are astonished that the owners do not appear. Undoubtedly the restitution is honestly made, and they think that the embargo on the other side should be raised (with the security mentioned by the Emperor). In the Burgos matter the King awaits the Emperor's reply to his letter demanding its reference to arbitrators according to the treaty of amity. This would mean that the main business would never be reached. As to safe-conducts for German and Italian troops, the Emperor's objections are unanswerable. 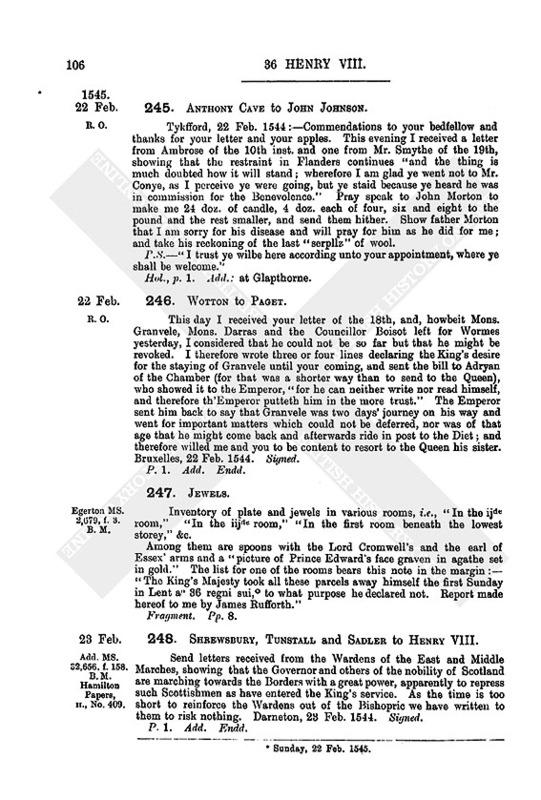 As to the declaration, their letters of 3 and 4 Jan. show that the King refused to be satisfied with the answer the Emperor gave to Hertford and Winchester. In their two conferences with Hertford, Winchester and Paget, the writers repeated what they said to the King, which proved unanswerable; and since then Councillors have only referred to it in a joking and shamefaced fashion. Told Paget in presence of the Master of the Horse that he seemed wrong in continuing to talk of it; and he retorted that none knew better than Chapuys who drafted the treaty, and he would like to know if the French king had not, by invading English territory, violated his engagements towards the Emperor in which he consented to its reservation, and also if the Emperor's treaties with both kings did not provide that in case of the one's invasion of the other the third should declare against the invader. 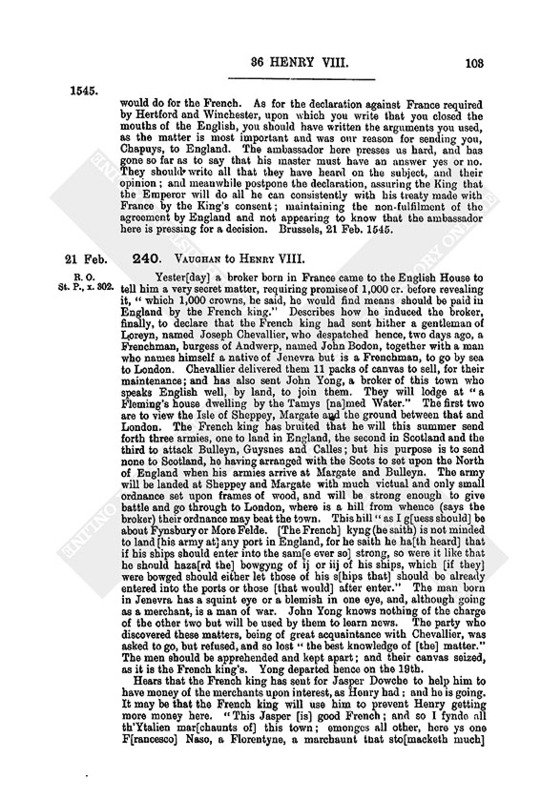 Replied to the last point that in the absence of a special clause the third party was not so bound, and, to the first, that Paget's master could not claim the advantage of a treaty which he always refused to acknowledge; adding that the reservation must be understood only in so far as it did not clash with the Emperor's treaty with France, made by the King's consent at a time when the French king was as much his enemy as now and was (according to his pretension) occupying his realm of France. 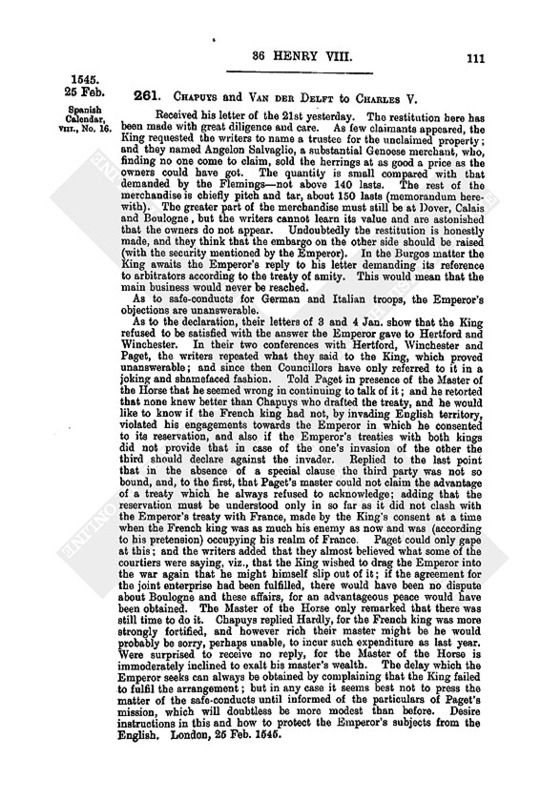 Paget could only gape at this; and the writers added that they almost believed what some of the courtiers were saying, viz., that the King wished to drag the Emperor into the war again that he might himself slip out of it; if the agreement for the joint enterprise had been fulfilled, there would have been no dispute about Boulogne and these affairs, for an advantageous peace would have been obtained. The Master of the Horse only remarked that there was still time to do it. Chapuys replied Hardly, for the French king was more strongly fortified, and however rich their master might be he would probably be sorry, perhaps unable, to incur such expenditure as last year. Were surprised to receive no reply, for the Master of the Horse is immoderately inclined to exalt his master's wealth. The delay which the Emperor seeks can always be obtained by complaining that the King failed to fulfil the arrangement; but in any case it seems best not to press the matter of the safe-conducts until informed of the particulars of Paget's mission, which will doubtless be more modest than before. Desire instructions in this and how to protect the Emperor's subjects from the English, London, 26 Feb. 1545. 262. Otwell Johnson to his Brother, John Johnson. At Lo. (London), 25 Feb. 1544:—Trusts that he and his wife are well. Lacks matter to write other than he wrote by Harrysone. The four load of wool from Glapthorne, brought by the carters of Wollerstone, are come, and I have paid them the 5l. and given a groat apiece, to drink, for their drivers, but they will not promise to return for the rest of your wools, having no lading from hence. Three half barrels of white herring I have sent to Northampton by them to Mr. Atkinsone at the Swanne, for your father Chauntrell, your brother and Vyllers. The said carters promised to call at Tykeford on Friday or Saturday next, when you may bargain with them. "For news, understand that Mr. Secretary Pagett is gone ambassador towards the Emperor (God be his speed) with a very earnest message, as the voice goeth, so that upon his answer tout sera faict ou failly. Guerre est plus a craindre que paix, come m'a dict mon captaigne (fn. n6) a ce matin, car le susdit messagier s'en va fort muny de raisons et paroilles piquantes." A great army of our ships will be abroad before Lady Day with 1,700 or 1,800 men. P.S.—"Sir, I pray you commend me to Thomas Flecton, and excuse me unto him for not writing to him by Wedde, but his maunde the gentill Evanke doeth bring unto him nowe. The nombre of the reed hering is increased, and I have added sprottes unto them, by cause I wold not have him to forgett with the same mande full of egges for your brekefastes this Lent for heir none will [be] hadde above iij or iiij a penny. I am sorry my syster your wiff hath made no better provision for you of such thinges owte of your countre." Hol., p. 1. Add. : at Tykeford. 263. Lennox to Robert Maxwell. By bearer I received yours of 23 Feb. wherein you desire me to advertise you what, in your power, may be to the King's pleasure and the liberty of your father,—not writing that you will do such things. I have indeed been a suitor for your father and would be glad of occasion by you and others, his friends, to continue my suit; "and yairfor wald have zow mair effectuis to set furth thingis to yat purpois." Your father has written heretofore that all within his rooms should do all things to the King's pleasure and they have not done so; and in my opinion it should be your duty to obey your father's commandment and offer "his houses, friends, servants and rooms to be at his Lordship's will to serve the King's Majesty accordingly." Advertise me by letter of your mind herein, for I will send to your father of all proceedings betwixt us, and intend to make suit for his Lordship as he, you and others give me occasion. My lord Whartoun has granted that a servant of yours may pass with necessaries to your father, and says that he sent you a conduct before and has never denied you thereof. Gibbe Yrrewing, this bearer, tells me that Thom Bell, your man, said to him that for the laird of Tulybardin and his servants he would do what pleasure he could in Scotland, but as for my servants or Thomas Bishop's he would do them the displeasure he could. You being suitor to me for your father, I marvel that any servant of yours should use such words in your company, and still more that you favour that false fellow who has broken his "lawte" here, to the dishonour of the laird of Tulybardin and Thomas Bishop. I believe that you will compel him to discharge his sureties and let him know that he has not said well. Carlislie, 25 Feb. Copy, pp 2. Headed: "The copy of ane I're sent by my lord of Leven[ax] to Robert Maxwell ansuerand ane writting of his ressavit ye xxiiij. day of Fabruuar." 264. Sir Ralph Evers to his servant John Wright. Call all the pledges to you and keep them safe, till I come home, within the castle, especially George Pringle's pledge. "Have me recommended to my Lady and Mistress Dallavall, with all the rest, shewing them that this Thursday I repair towards Jedworthe, by the grace of God. Ye shall deliver Mistress Dallavall this button from me and have me recommended unto her; and also ye shall deliver these letters here enclosed to Mistress Kent from her husband." Warke, 25 Feb. Signed. 265. Sir George Douglas to Henry VIII. At Lawder (q. Dalkeith? ), on 24 Feb., received the King's letter dated Westminster, the 19th, mentioning receipt of the writer's letter and communications with Sir Raife Eiverie. Explains that he never deserved the King's displeasure; and, being imprisoned in Edinburgh castle and his life only saved by the coming of the King's army, that army burnt and took away his goods and his friends' goods, so that he suffered 1,000l. of hurt more than any other in Scotland. As to the Scots being informed that, if master here, the King would make their gentlemen no better than shepherds, there is such a bruit, due to the "extreme war that is used of killing women and young children" and to the reports of Scottish prisoners coming forth out of England, who have heard gentlemen say that the King will make a plain conquest, and kill man, woman and child. Gentle handling and good words will help the King's affairs. Where the King writes that the Queen, Governor and nobles here make suit for the treating of the marriage and of peace, Sir Raiffe Eiverie said that his Majesty would not treat unless the Scots prisoners first entered, and then the ambassadors should have passport to come to Darneton and show their commission and articles to his Lieutenant. Moved this to the Governor and lords (the Queen being departed from Edinburgh to Stirling at his return) and found them unwilling; so that he proceeded no further. Now he will move it as of himself, but cannot send so hasty answer as the King desires, because the Queen is in Stirling, the Governor in Lawder within 10 miles of Gedbruchg and the lords mostly in their own countries. Will however be diligent to learn their perfect mind. Will pray God to further these good works, and will gladly set forward the union of the two realms. Lawder, 25 Feb. Signed. Pp. 3. Add. Endd. : 1544. 266. Sir George Douglas to Sir Ralph Evers. I received the King's writing and yours at Dalkycht, 24 Feb. "The Governor vas departing towart Lawder at the present. And ze requayre me to make deligense to send ane ansur one to the Kingis Mageste," I send a letter to the King, but cannot possibly so soon gar him know the matter he writes for. Touching my plate and gear at Berruik I have not written to his Majesty, but desire you to be a suitor for me; and trust that the man will be commanded to deliver it at the next post that comes. Lawder, 25 Feb. Signed. 267. G. Lord Cobham to Henry VIII. This morning, at 9 a.m., I received a letter from Mr. Stephen Vaghan from Andwarp (copy enclosed) and, accordingly, making search (by bearer, who brought the letters), the party was found even as he arrived and brought to my lodging, where he and his companion were stripped and searched, "and the letters and writings that were found about them I do send to your Majesty closed in a boget the key whereof I do send also closed in this letter." 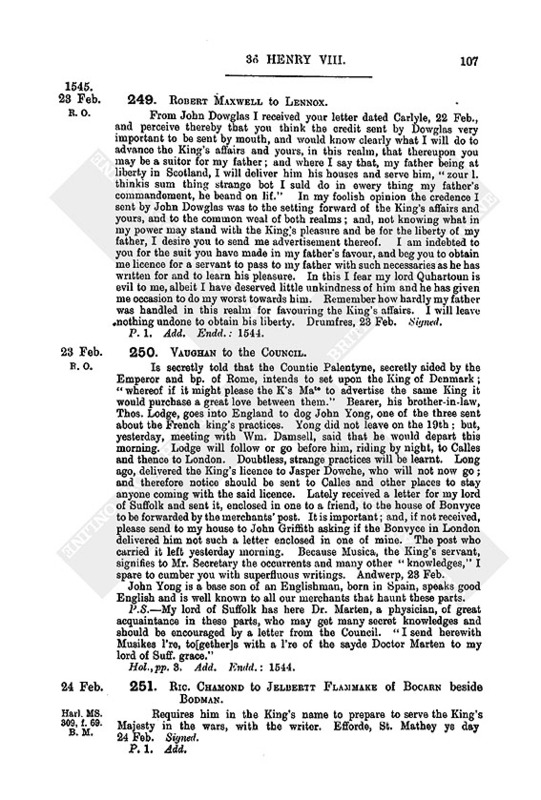 The letters in the forepart of the budget were found upon him that I sought for, named John Yong, son (as he confesses) of John Yong, an Englishman dwelling in St. Sebastian's in Chepusca; those in the back part were upon the other, named John Gery, who was searched because in company with Yong. I keep both safe till I hear further. He that is gone along the seas and should entertain Yong is named John Bowden and lies at the house of one Bastyan besides Fanchurche, who is gardener to Bonvise. Calais, 25 Feb. 1544. Signed. My lord Deputy of Gales wrote me a letter within these ten days commending a suit of Henry Takoen, a gentleman of Casseles, and of a brother of Nycasius my servant, to carry 100 last of herrings into France. They both serve the King honestly, and my lord Deputy, to encourage them, gave them hope thereof; and they have made provision and Nycasius's brother is already departed towards Dipe and Rowen. My lord Deputy's last discourse of the provision of ships came by intelligence from them. If the King would give them leave to carry it by sea it would be somewhat to them and no great relief to the enemies, who have great quantity daily, by land, from hence. Pray take order for the expedition thereof, with my lord Chancellor's advice, "for the heryng fayre faryth fast away." Osten, 25 Feb. 1544. P.S.—Pray advertise my lord Deputy of the King's pleasure herein, "with sum litle knuk not to be herafter so lyzt to promise such thinges without knowledge furst of his Majesty's pleasure." Hol., p. 1. Add. Sealed. Endd. 269. Charles V. to Juan de Vega (Ambassador in Rome). He has done well in not openly opposing the aid which the Pope declares that he will give to France against England. * * Brussels, 25 Feb.
n1. February 17 in 1545.
n2. Down to this point the letter is printed in St. P. v. 590.
n3. Sunday, 22 Feb. 1545.
n4. Granvelle and his son, the bp. of Arras.